A few weeks ago I had blogged about how I finally got off my backside and decided that I needed to meet some of the wonderful foodies here in Edmonton. My very first event was Eat Alberta, organised by Slow Food Edmonton. I was very apprehensive at first. This was my first time out of the house and doing something of my very own, and meeting people who I usually know via their blogs or Twitter. Almost like a first date of sorts, after a lot of internet flirting :-) It also added an element of seriousness to my food blogging. 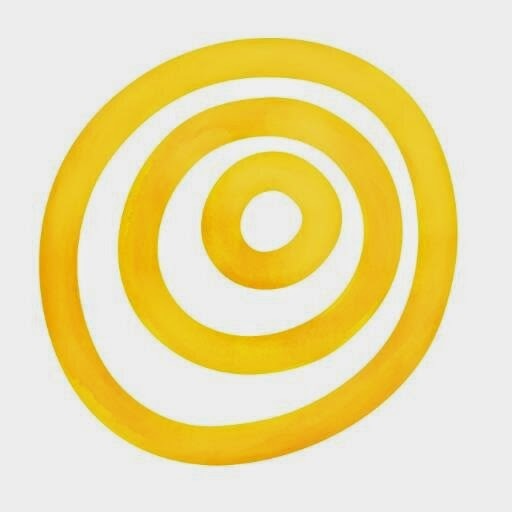 When I first started this blog, it was a sporadic collection of recipes. I started it after receiving requests for recipes that I made on Masterchef. However, in the last year or so, I have started taking it quite seriously, and enjoying it a lot more. I have learnt how to write better, take better pictures (not quite there yet, but hopefully improving) and well, blog more, in general. Eat Alberta was my first event that I was going to, hopefully, as a serious blogger, and so it was special. It almost didn't happen, as I got into a babysitting problem with Kay working away this weekend. Luckily my in-laws came to the rescue and postponed their departure to Terrace, so I breathed a sigh of relief! Almost as soon I entered the main room, I started chatting with a few people, including Christine from WannaFoodie. And had my first surprise of the day when found out that there were a lot of other people there, and not just food bloggers. That was a surprise, because I actually hadn't thought that so many people from so many different walks of life are so passionate about their food and where it comes from. The keynote address was interesting, though I feel that it would have suited Kay more. He is the gardener, I am the cooker (says Aditi)... but still, it was an interesting perspective. What I took away from the address was not just how to grow vegetables and food, but taking that leap of faith and doing something that you love doing. I had been considering a career in food, but was too scared to take that first step. Thanks to Jenny and James, I realised that what was holding me back was fear and a lack of confidence, not a lack of knowledge or ability. So, starting today, I have been looking out for opportunities to write more about what I know best, Indian food. I have also been looking out for opportunities that I can take that would eventually take me where I want to go, not where my fear is pushing me towards. The day went by swiftly after that. I did a session on goat's cheese and honey tastings (more on that in Part 2) but my next session was pasta making. Here was a challenge that I had been meaning to take on for a while, but was just too lazy or cranky to do it. I make my own bread, and the majority of my food from scratch, yet hadn't gotten around to making my own pasta yet. The difference, however, was in trying to follow a recipe on your own, or having someone showing you how its done. Kathryn Joel from Get Cooking Edmonton showed us how to make pasta with 2 ingredients. Yes, you read that right. Two ingredients. Eggs and 00 flour. Wow! How had I ever missed that? She was patient and took a lot of time to show us how its done. I made a mess of my dough, but somehow it turned out OK in the end. Kathryn then showed us how to make fresh basil pesto (oh my, the aroma of that was amazing!!) and gave us little pots to take home. We took the dough back to our homes to make pasta, and I of course, rushed out to the Italian Centre and bought myself a pasta maker. Now that was fun! Aditi and I cut the dough and slid it through the pasta machine, the dough somehow miraculously turning into smooth, elastic sheets of pasta. I then cut the pasta into tagliatelli. Unfortunately, Aditi doesn't really like basil pesto (too greeny, gah!! ), so I saved it for when Kay's home, and whipped up an easy sundried tomato and olive pesto instead. I can only say, after gobbling up the pasta, that I didn't know what I was missing! No more store bought pasta, from now on its only fresh stuff allowed in Casa Peters - Jones! I am reposting the pasta recipe from Kathryn, and my pesto. Go check out her website for more fun stuff! The basic proportions are 1 egg for every 100g flour. As Kathryn says, this will totally depend on how big the eggs are, and these are just guidelines. I ended up not using all my flour as my eggs were not very big. Put the flour on your kitchen counter or in a bowl and make a well in the centre. Break in the eggs, and using a fork, swirl in the flour from the sides into the eggs, until it forms a dough. Don't worry if its crumbly, it will all come together. Knead very well, almost 10 minutes (this is a real workout!) until the dough is smooth and elastic. Rest the dough for at least half an hour. Slice and roll out the dough a little bit, then press through a pasta maker, at the largest setting twice. Gradually reduce the settings, until you get a very thin sheet of pasta. Cut into desired lengths. I made tagliatelli, using the cutter in the machine. Dry the pasta on a tea towel sprinkled with a little flour. Kathryn suggests coating the pasta with some semolina for a little more texture, but I didn't do it this time. Boil a pot of water, and add a handful of salt. Slowly ease in the pasta, cooking for 2 -3 minutes, until the pasta is just cooked, with a bite to it. Drain, reserving about 1/2 cup of the cooking water. Reserve 1/4 cup of the soaking water from the tomatoes. Blend together the rest of the ingredients, except the parmesan, into a smoothish pesto, adding the hot water if you need to loosen up the mixture a little. Taste, and adjust the seasoning. The olives tend to be salty enough that you may not need any additional salt. Add the pesto to the reserved pasta cooking water, and whisk together to emulsify the pesto. I know the pictures aren't great, but you'll just have to trust me when I say that it tasted absolutely amazing!! 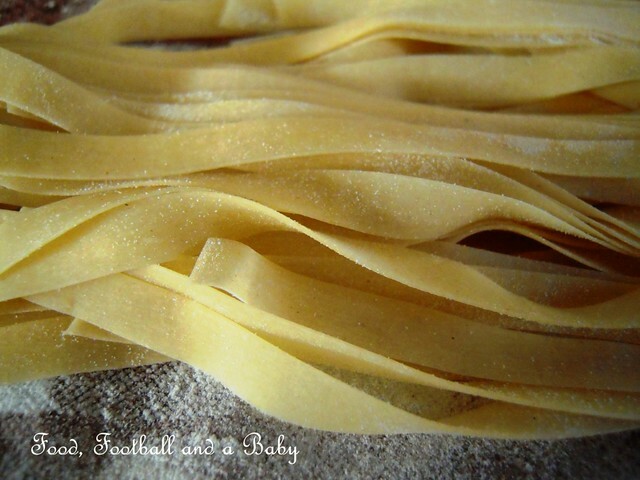 Fresh Pasta for Monthly Mingle hosted by Jul's Kitchen. How brilliant to have attended an event like this. I did my first real blogger this year and found it daunting but totally rewarding too. Love the pasta, again something I have not yet tried but you make it look so inviting. Time to invest in a pasta machine I think!! Wow sounds like a great day .... I've never been to a Slow Food Event, but they do sound like fun. I gave up on my pasta machine after a short while, as it was easier to buy fresh pasta from an Italian deli in Soho. Their pasta is much better than mine ever was. Your pasta looks amazingly tasty! I missed that class but am going to take notes from each of you and make Kathryn's pasta right away. So nice to meet you! Looking forward to sharing more. Your enthusiasm from Saturday when I met you, has transferred itself to your page. What a lovely inspirational read! This is the reason we worked to put together this conference: to inspire, to motivate... and it is clear you will reconnect and continue to collaborate with your new found friends. How wonderful. That Jenny motivated you to push forward past a fear: standing ovation.That you bought a pasta machine on the way home: Bravo to you! I can't wait to read part 2! Hi Michelle - Congratulations on the new pasta machine. It is amazing how easy it actually is to make pasta once you've been shown how. When I tried from a book, it was a disaster. I'm looking forward to stealing some of your recipes too! Great Post! I was wonderful to meet you at Eat Alberta, and I look forward to the second part of your post! I stumbled upon your blog from the Garneau home Kitchen blog. It's a lovely read. Glad that you bought yourself a pasta maker. Nothing like fresh tagliatalle! How expensive is the pasta maker at the Italian Center shop? Thanks for posting the pasta recipe. I had to miss out on this session - so many to choose from - it was tough to narrow it down to just four! 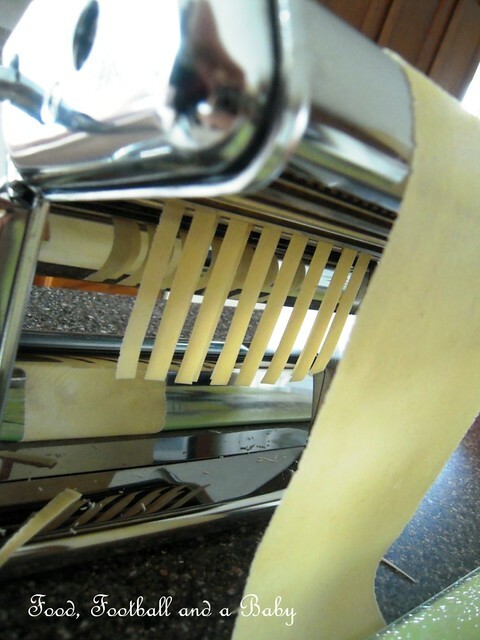 I am thinking about getting a pasta attachment for my mixer - I really want to make my own stuffed ravioli. The skies the limit with homemade stuffing! sounds like it was a great event Michelle! Looking forward to your part 2 post. I've never tried to make pasta - not sure why. Bread scares me so maybe I associated it with dough. lol. But your pesto sounds delish and I can't wait to try it. ps. I think your pics are improving a lot! Wow. I just discovered your blog and you got me hooked with the first post title! Oh my Michelle, this is so Italian!! 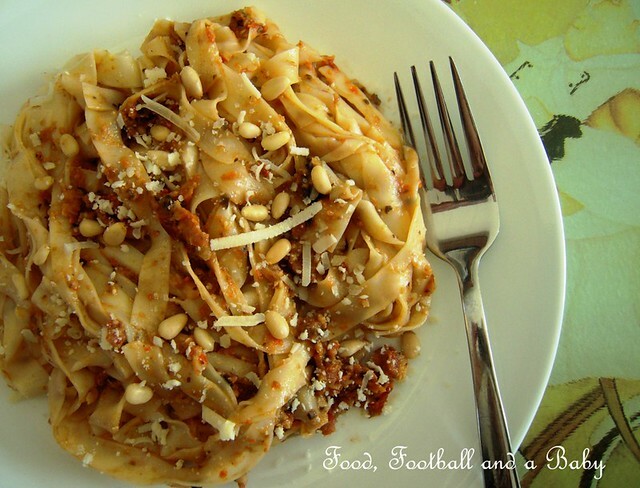 Lovely result, I love the texture of your pasta tagliatelle! wonderful work! Such beautiful pasta. I haven't used my machine for a couple of years. Mine doesn't have that nifty cutter gadget. Sounds like a great event. I'm drooling with envy! And the pasta dish looks awesome. Pretty incredible how easy it is to make your own pasta once you've tried it. Thanks for sharing your adventures - and delicious dish with Presto Pasta Nights. So glad to find your pretty blog via the Mingle. It gave me the excuse to take out my machine from the back of the cupboard. As you say, 2 ingredients, a bit of a work out and it's done - beautiful silken pasta strands.